CHIMOIO, Mozambique, Sep 25 2014 (IPS) - Eherculano Thomas Rice, is pleased to have harvested 40 bags of white maize from his eight-hectare field in Chimoio, in Mozambique’s Manica Province. But he knows that his productivity and yield would be higher if he had been able to afford to buy fertiliser to add to his crop. Rice grows cowpea to boost soil fertility in his field and improve his productivity, only buying fertiliser when he can afford it. 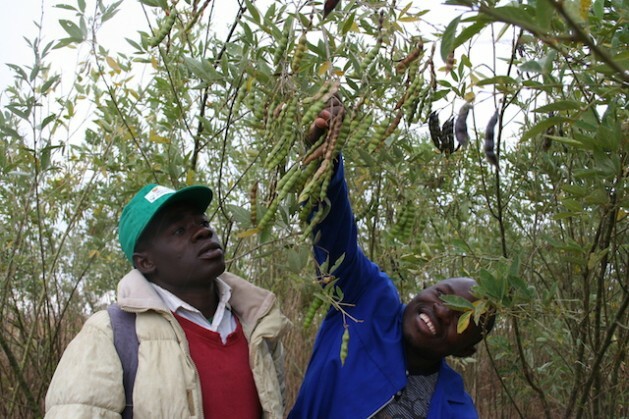 According to local NGO Farm Inputs Promotions Africa (FIPS), which works with about 38,000 farmers in five districts in Manica Province, a 50kg bag of fertiliser costs about 33 dollars. And a farmer will need three bags per hectare of land. Africa is paying the price of low productivity because of limited use of commercial fertilisers by smallholder farmers who produce the bulk of the continent’s food. “For now I intercrop my maize with pigeon pea, to increase soil fertility and it works. But fertiliser could boost my productivity,” Rice tells IPS, during a walk around his farm as he points to the mature pigeon pea plants. Low fertiliser use by smallholder farmers like Rice is a common narrative in sub-Saharan Africa — a continent which currently uses about eight kg/ha of fertiliser. It is a figure that pales against the global average of 93kg/ha and 100-200kg/ha in Asia, according to the Montpelier Panel’s 2013 report, Sustainable Intensification: A New Paradigm for African Agriculture. Rice, who was trained by FIPS as a village inputs promotion agent, runs demonstration plots teaching farmers how to use improved inputs. Farmers are given input kits of improved seed and fertilisers as an incentive for them to buy them themselves. Agriculture currently contributes about 25 percent of Mozambique’s GDP and a 2004 Ministry of Agriculture and Rural Development evaluation report indicates that improved seeds, fertilisers and pesticides are capable of raising productivity by up to 576 percent. Charles Ogang, the president of the Uganda National Farmers Federation, tells IPS via email that food security in Africa is compromised because farmers are not using enough agricultural inputs, in particular fertilisers. “There are many reasons why farmers in Africa are still hardly making a living of agriculture. One of them is the lack of access to key tools and knowledge,” Ogang says. According to the First Resolution of the Abuja Declaration on fertiliser, African governments have to increase fertiliser use from the average of eight kg of nutrients per hectare to 50 kg of nutrients per hectare by 2015. “Although no country in sub-Saharan Africa has achieved this target, there are some signs of improvement in the implementation of the Abuja Declaration on Fertiliser by the countries and Regional Economic Communities since June 2006,” says Richard Mkandawire, vice president of the African Fertiliser and Agribusiness Partnership (AFAP). He says that Malawi has increased its fertiliser use from an average of 10kg/ha in the 90s, to a current 33kg/ha, and shows the commitment of countries to reach the target of 50kg/ha. Mkandawire tells IPS that the partnership is undertaking technical research to advance appropriate soil management practices, including the facilitation of soil mapping. It is also testing soil to ensure that smallholder farmers are able to access fertiliser blends that are suitable for their land. Mkandawire acknowledges that there is no silver bullet to lowering the cost of fertiliser for smallholder farmers. But he says AFAP has employed several types of financial mechanisms to help lower the cost. The mechanisms include facilitating guarantees to fertiliser distributors for retailer credit, financing assistance to importers or blenders to improve facilities, training, financial and technical assistance to warehouses at ports. In August, AFAP in collaboration with the International Fertiliser Industry Association (IFA) launched a multi-media campaign in the Ethiopian capital, Addis Ababa, to push African governments to invest in agriculture productivity. According to the campaign, African governments should ensure farmers have access to adequate and improved inputs especially fertiliser for agriculture transformation and economic development. In June, African heads of state committed themselves to use agriculture growth to double food productivity, halve poverty and eliminate child under nutrition by 2025 when they came up with the Malabo Declaration following a meeting in Equatorial Guinea. Charlotte Hebebrand, IFA director general, says Africa’s fertiliser demand is less than three percent of the global market. The continent’s production continues to be low and a significant share of the local production is exported as raw materials. “Our estimates are that demand will increase over the course of the next three to five years in countries that are stable politically, committed to allocate at least 10 percent of their budget to agriculture, and those that have established sound fertiliser subsidy schemes,” Hebebrand tells IPS. Poor supply chains for fertilisers where farmers often have to travel long distances to buy a bag of fertiliser, are a primary cause of low fertiliser use in Africa. Poor farming practises are also worsening soil health in Africa. AGRA’s Soil Health Programme is working on solving the problem by supporting an extensive network of partnerships in 13 countries in which three million farmers have been trained in using organic matter, applying small amounts of mineral fertilisers, and planting legume crops like cowpea, soybean and pigeon pea. This article is promoting GMO’s in Africa. If you travel back through the chain of references you will see that it is a mouthpiece for ACRA, Allian for a Green Revolution in Africa, which is a Bill Gates’ foundation supported front for Monsanto, Dupont et al. They are not impartially researching what is best for African local communities – they are promoting an outside agenda in which few Africans have had a voice, but they ARE creating African mouthpieces by funding their model in universities and agricultural institutions, and getting the African political elites on their side. Most of this is done through seeds, and using often women to market their seeds to small farmers. Theri model does NOT support sustainability, it support “commodifying” African agriculture, which means that instead of concentrating on feeding the nation, they will try to create export crops. Farmers will oincreasingly be buying their seeds and fertilisers, instead of being taught the sustainable way of improving their own seeds, and of improving their own soil with minimum input from foreign fertilisers. The GMO model is problematic because it has been shown to break down in the long run, after showing short-term improvements. The increased use of herbicides pollutes water, other plants and animals and insects. It especially does not help females, please research this, as it is too important to ignore, it is done by stealth and misleading information. There are many examples of sustainable development projects being tested, or implemented, but they do not have slick media promotions like AGRA, so you have to dig for them, but many are very encouraging.